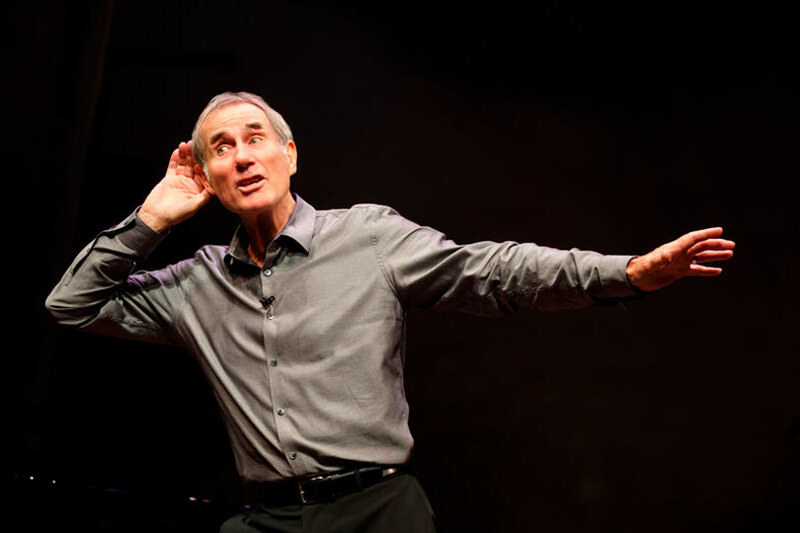 The apparently British-as-British-can be Jim Dale, star of Carry On Films and Barnum, and an MBE honored by the Queen for promoting English literature for children, is actually about as Transatlantic as you could wish for. I first came over for the Academy Awards in 1966 for writing 'Georgy Girl', the song from the film. [He was nominated for an Oscar.] Then I came over with the Young Vic – I was in their first production in 1970, Scapino, and we took it to America in 1973. Because of that I was offered work in the States. Three Disney films (Pete's Dragon, Hot Lead and Cold Feet and Unidentified Flying Oddball) came along very quickly then towards the end of the '70s I was invited to go back to America to create the role of Barnum in the big Broadway musical. The work was constant in America, I just kept going back, which was rather nice. Do you go back to England often? I used to when my grandchildren were much younger. I have three sons and five grandchildren and they live in London. But now they come over to see me more than I go over to see them. They love New York as well–I think they know it more than I do–and we spend weekends in the country fishing and boating. The last time I worked in London was when I played Fagin in Oliver at the Palladium in 1996 and when I do visit I'm there to see the family. Was it work that finally decided you on settling in the USA? Well, I find it's always a good idea to live where your wife lives! She [Julia Schafler Dale] is an American, she lived in New York and she was the owner of a beautiful art gallery on Madison Avenue. We got married 35 years ago so we got a nice apartment in town. Did you find it easy to migrate to New York? Oh yes. If you're interested in a career in television or films then you do not you live in New York, you move to Los Angeles where all that action happens, but since moving to America I've had no interest in them. I just love theater so much I'd rather do a small play on Broadway if I think it's a good piece of material or a good director. New York, to me, is home because it has so many theaters and so much happening on the stage here, which is my forte. Incredibly Jim was born on August 15, 1935, making him 80 years old this year. He doesn't look it, or sound it. He says he's still 23 inside. But he's never stopped working. At age nine he started appearing in Music Halls (the UK form of Vaudeville) touring around Britain for 52 weeks a year. To illustrate his longevity, he was inducted into the American Theater Hall of Fame in 2009 and he has just finished a play on Broadway, The Road To Mecca by Athol Fugard, in which he starred with Rosemary Harris. In the UK Jim is best known for the Carry On films, a series of 31 low-budget British comedy films made between 1958 and 1992 from the rich British tradition of music hall comedy and risqué seaside postcards. They were 'naughty', rude but never explicit or offensive, with double-entendres a specialty. Jim appeared in 11 of the 31. That was a joy – I enjoyed working on all of them. They made two and a half Carry On films a year. It was only eight weeks work on each film, but it was absolutely eight weeks of fun, working with such comedic talent. In the US Jim is probably most famous for his star roles on Broadway and, outside NYC, for narrating the Harry Potter audio book series, for which he's had two Grammy nominations and as the narrator of ABC's Pushing Daisies. Is he treated differently by the public in Britain and America? When I do my one man show out of town over here in America, I find that a lot of the audience have never ever seen me in a Carry On film or even on Broadway. They've only been listening to my voice for the last eight years. But they come to the theater to find out who this Jim Dale is. It's a joy, to have them come up afterwards and say they didn't know I did this or that or they were surprised when I did Shakespeare. In New York people sometimes stop me and say they saw the show last night, and in England they know my face from Carry On, but I'm not in a movie star situation. I can go to my home in the country, only about 50 miles from New York, and no-one will know who I am. Jim is one of the most multi-talented people in showbiz. After school he trained as a dancer but his professional debut was as a comedian in 1951, at the age of seventeen and a half. He had an 'eccentric dancing' act (useful for later slapstick comedy), he's a talented singer & songwriter and he has been a radio DJ – all apart from the stage, television and movie acting, audio books and video games voice-overs. Which is his favorite? This is 60 years you're talking about – a lot can happen in that time! My favorite? Whatever I happen to be doing at the time, because it will have been selected very carefully. I do not jump head first into things I know nothing about. I take the advice from Christopher Logue's poem: 'Come to the edge. We might fall. Come to the edge. It's too high! Come to the edge. And they came. And we pushed, And they flew.' I've gone through my career in the hands of people I respect, in the way of directors, producers, other actors... I've taken their advice and the challenges they've thrown at me. I accept it because I have such respect for their talent. I don't think there's anything I've done over here that's been a flop. I won't say it's luck, it's being very careful to select the right material and listen to the advice you're given. One of your early collaborators was Laurence Olivier. What was he like to work with? He asked me to join the National Theatre. He was wonderful – not only did I appear with him on stage in The Merchant of Venice, he also directed me in Love's Labour's Lost. Larry loved physical comedy, and I had a lot of experience of that and I brought that to the National. For example, Autolycus in The Winter's Tale talks to the audience. Having been a stand up in music hall, I knew what that was like, but a lot of actors had never had that experience. That's what I brought to my first play at the National Theatre, which was called The National Health, by the great Peter Nichols. Many times I didn't know quite what the Shakespearean words meant, so I'd ask one of the cast, and they'd say, 'I'll tell you if you give me a bit of 'business' to do when I walk on – I was swapping comedy bits for the knowledge of what the hell it was all about! I was working with people like Derek Jacobi and Joan Plowright, Jeremy Brett and Ronnie Pickup and Charles Kay – Charlie's still one of my greatest friends. And directors like Michael Blakemore and Frank Dunlop. I think Frank instigated it all, and he's probably been most influential in my life, as a director and a friend. Theater's a group effort. Take this 'one man show'... forget it! There's a team behind it: the director is Richard Maltby, who co-wrote Miss Saigon and wrote the musical Ain't Misbehavin'. I gave Richard so much material, and over the years we've edited it down so every word is important. On that stage I will be speaking... just let me work this out... 13,096 words, every night. And Richard will come up to me and, You left a word out tonight!" It looks improvised – thank God! – but it's not, it's polished. I have a great pianist, Mark York, who used to be Cy Coleman's second in command (Cy was one of the great Broadway composers, with Sweet Charity and Barnum) so I have that going for me. I also have the conductor of The Lion King, Aaron Gandy, as musical arranger. I have the very best talent round me. The unfortunate thing is, we're all Leos – we fight all the time to be heard! Was it more a question of what to decide to leave out of the show? Absolute right, I've got enough great material for two more one man shows, it just wouldn't all fit into this two hour show. Is it a different show for London? I've had to change it slightly because there are words and expressions that people don't understand – here in America nobody knows what you mean by 'knackered'. I'll also be incorporating a little bit more on the Carry On films – but this is NOT 'Carry On Jim Dale'. It's an evening of 'Who the hell is Jim Dale, what's he become, who is the man behind all those characters?'. Is there a role you've never played that you would like to? 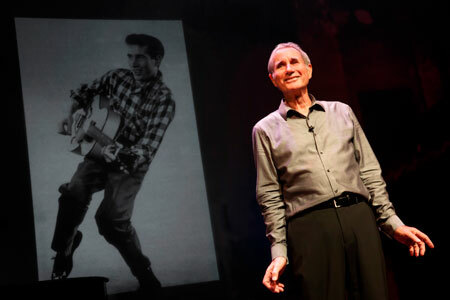 Finally, what is the best thing about being Jim Dale? Not knowing what's coming next. Actors always think this is our last job – we're terrified we'll never be asked again. But after sixty years I know there's always something else around the corner, even if I don't know what it is yet. It may take a few weeks, but I'll be turning that corner and thinking, Oh my God this is exciting!